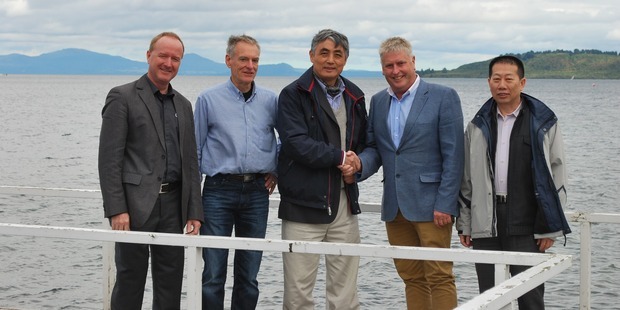 Representatives of Fenglin Group visited Taupō in 2015 to explore the possibility of building a sawmill and wood-processing plant in the area. A Chinese wood-processing company that Enterprise Great Lake Taupo has been hoping to lure to the town has instead opted to build a new 100-job particle board factory in Kawerau. Kawerau's location, proximity to the Port of Tauranga, rail connections and the available land all played a part in the Guangxi Fenglin Wood Industry Group decision to build the plant in Kawerau, the Kawerau District Council's economic and community development manager Glenn Sutton said. The plant will be built on Putauaki Trust land and produce 600,000 cubic metres of panel boards annually, mainly for export to China. Fenglin executives had also visited Taupo in 2015 to verify a feasibility study into building a new sawmill and associated wood-processing plant in the Taupo district, after being approached by Enterprise Great Lake Taupo. The company is thought to have spent more than US $1 million into seriously examining a Taupo option, attracted by the access to forestry, geothermal heat, central location and labour force. It had even appointed a project director. But it put the idea on hold last year, apparently to focus on buying a business competitor. Enterprise Great Lake Taupo general manager Will Samuel, who took up the position in March, said while the work done with Fenglin was before his time, Taupo was still a strong investment opportunity for other wood-processing companies. "There's a number of other organisations interested in investing in the Taupo District because of our advantages such as geothermal energy and the proximity to the Central North Island forest. Given the scale of the potential investment, the decisions are not made quickly." he said. He said Taupo was always competing against other wood processing areas such as Tokoroa, Kawerau and Rotorua to attract investors.